Dr. Louie earned his B.A. degree in Molecular and Cell Biology at the University of California at Berkeley. He graduated medical school from Drexel University (formerly known as MCP Hahnemann University) in Philadelphia and completed his internship and residency in internal medicine at California Pacific Medical Center in San Francisco. He subsequently completed a fellowship in rheumatology at the National Institutes of Health in Bethesda. Additional training in clinical investigation at Duke University School of Medicine earned him a Masters in Health Sciences degree. Dr. Louie served as Assistant Professor of Medicine in the division of rheumatology at Johns Hopkins University School of Medicine for 6 years. There, he relished his role as a preceptor for trainees in the classroom, ambulatory and inpatient settings. Dr. Louie has published numerous articles in peer reviewed medical journals and has presented at local and national scientific meetings. He has also served as principal investigator and co-investigator in various clinical trials of new arthritis therapies. 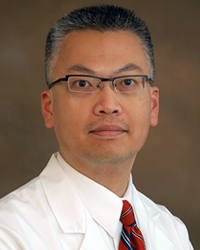 After leaving Hopkins, Dr. Louie worked in a private practice before joining ARA. Though he treats all manner of rheumatological conditions, Dr. Louie has particular interest and expertise in inflammatory arthritis, including axial spondyloarthritis, psoriatic arthritis, and rheumatoid arthritis. Dr. Louie is an active member of SPARTAN, a professional organization of North American experts in spondyloarthritis and has lectured on the topic. Dr. Louie is board certified in rheumatology and internal medicine, and is a Fellow of the American College of Rheumatology. He brings his expertise, compassion, and dedication to ARA. He will be serving patients at the Frederick and Wheaton offices.